What is Homemaker and Home Health Aide Care? A Homemaker or Home Health Aide is a trained person who can come to a Veteran's home and help the Veteran take care of himself and his daily activities. Homemakers and Home Health Aides are not nurses, but they are supervised by a registered nurse who will help assess the Veteran's daily living needs. This program is for Veterans who need skilled services, case management and help with activities of daily living. Examples include help with bathing, dressing, fixing meals or taking medicines. This program is also for Veterans who are isolated or their caregiver is experiencing burden. 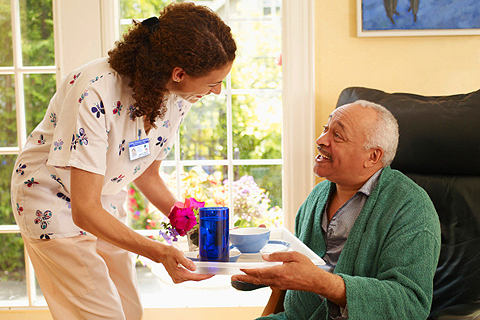 Homemaker and Home Health Aide services can be used in combination with other Home and Community Based Services. Homemaker Home Health Aides work for an organization that has a contract with VA. A Homemaker or Home Health Aide can be used as a part of an alternative to nursing home care, and as a way to get Respite Care at home for Veterans and their family caregiver. The services of a Homemaker or Home Health Aide can help Veterans remain living in their own home and can serve Veterans of any age. 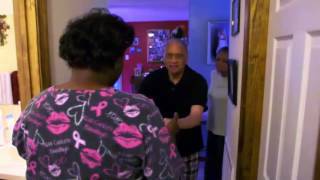 Watch the video to hear what home health aides and Veterans and their families have to say about the Homemaker and Home Health Aide program. Am I eligible for Homemaker and Home Health Aide Care? Since Homemaker Home Health Aide services are part of a service within the VHA Standard Medical Benefits Package, all enrolled Veterans are eligible if they meet the clinical need for the service. A copay for Homemaker and Home Health Aide services may be charged based on your VA service-connected disability status. Homemaker Home Health Aide services can be used in combination with other Home and Community Based Services. Services are based on your assessed needs. Talk with a VA social worker to find out what specific help you may be able to receive. For example, an aide may be able to come to your house several times a week or just once in a while. You can continue to receive an aide's services for as long as you need extra help with your daily activities. If Homemaker or Home Health Aide services are right for you, your VA social worker may be able to help you make arrangements for those services. You can also use the Locate Services and Resources page, found on the left navigation menu, to help you locate Home Health Aide services. I like living in my own home, but my wife passed and there're things I just can't do for myself because I can't move around very well. The Home Health Aide helps with the laundry, cleaning, shopping and some of the cooking and getting me to appointments. My mom and I both live in small towns about 130 miles apart. I visit twice a month, but between visits an aide helps her with bathing and fixing her hair and organizing her medicines in a weekly pill box.